A first competition in four years beckoned for DCU table tennis club – but after only being reformed early in the semester, they surely couldn’t leave a significant impact. To jump into the high pressure environment of intervarsity competition with just a handful of weeks of proper preparation time as a team is not unheard of, but it almost never leads to any notable success unless something truly special is in the offing. Yet the Glasnevin university finished third in the team event of the Table Tennis Ireland Intervarsity Championships, held in Trinity College, a quality achievement for a special side backboned by Ireland international Ryan Farrell – who would have a little bit more to celebrate that weekend. 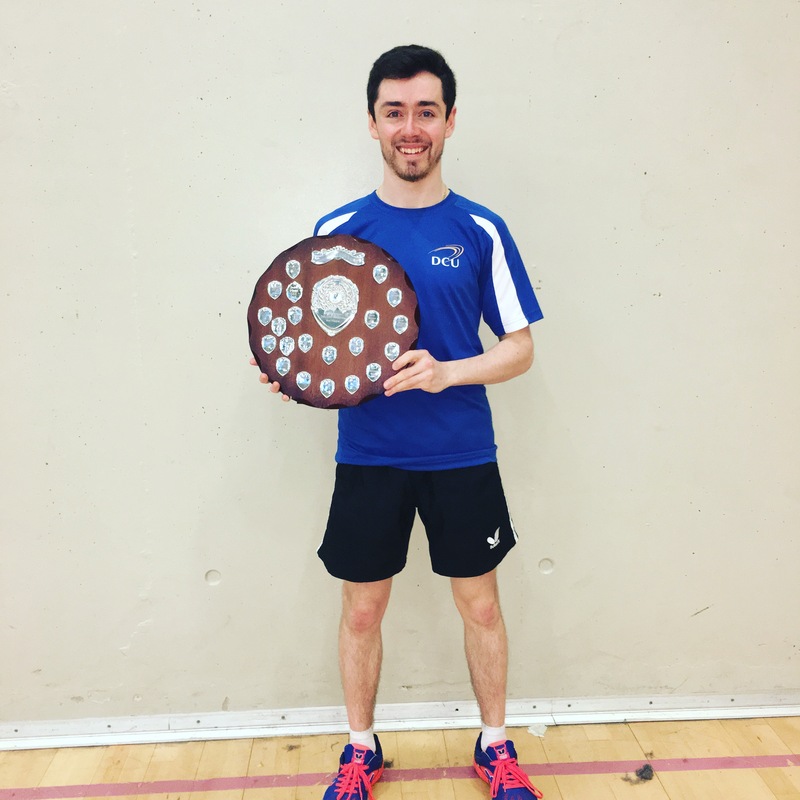 Farrell picked up the win in the men’s individual tournament, ensuring DCU came home with significant silverware from their first trip back to the top table. “Being honest, it was pure elation to come out on top against such a strong field of domestic and international players,” Farrell told The College View. Farrell was turned over by UCD’s Alex Gillen in the team semi-finals the day before his individual test as UCD swept all their opposition en route to a record 19th title victory, ultimately defeating UCC in the final. He would advance to meet Gillen once more in the individual final the following day and this time he was able to take revenge, winning in four sets to take the intervarsity title at his first attempt. The Business Studies student may not have expected to bring home the top prize going into the tournament, but knew he stood a good chance. “I think that to compete at the top of your sport, you have to have high goals and expectations for yourself, and more importantly, you have to believe that you can win,” Farrell noted. “But while it certainly wasn’t the case that I expected to win – I was quietly confident that if I played to my ability, I would have a good chance of making the final. “I had trained hard for the tournament, and analysed my likely competitors strengths, weaknesses and their styles of play. “But as we all know, anything can happen in sport with the best laid plans and all that, and having suffered an unexpected loss in the team event the previous day, I used the experience to my advantage with the added incentive to win and prove to myself that my strategy works. Farrell also hopes success in the team tournament at the first time of asking can help attract more players to DCU in the coming years. “It’s still early days as the club was only re-established earlier in the semester,” he noted. Farrell had little time to rest afterwards as he was pulling on the green jersey for his country just a handful of hours after winning the intervarsities. He, along with rival Gillen, Gavin Maguire, Owen Cathcart, and the debuting Art McLaughlin, were named in the five-man Ireland team to take on San Marino, kicking off their European League campaign with a comfortable victory over the Sammarinese in Blackrock College. Further trips to the Apennine nation, as well as Lithuania and Azerbaijan, await for the Irish team in their attempt to secure European Championship qualification, as well as welcoming the two Eastern European nations to the Emerald Isle. The confident but humble Farrell maintains that determination is the key for all young athletes to succeed in their chosen sport, and dreams of representing your country will always be a motivator, regardless of discipline. “Getting the opportunity to represent your country in any sport has to be a highlight for any competitive athlete.,” he said. “I received my first cap as a 13 year old in Bridlington back in 2009, and it was the proudest day of my life. “Since then I have represented Ireland over 50 times at Cadet, Junior and Senior level, with the highlight being my first Senior cap in Tokyo at the World Championships in 2014. “But pulling on the green jersey is always a special occasion, and one which inspires me to succeed.